Ha, I’m kidding. Okay, so Jodi McAlister has worked to make the love interest of VALENTINE really hot, and I’m fully appreciative – you know I’m on board with hot love interests. But above and beyond that, I think VALENTINE is actually a really well-crafted blend of romance and paranormal fantasy. You know exactly what you’re getting, because it’s written on the tin: if you weren’t interested in a romance story, the title of the book alone would be enough to put you off. But knowing that I was going to get a strong romance thread even before I started reading allowed me to just relax and be swept along by the rest of the story, which brings fairies to life in one of the more unusual settings (the Australian bush) that I’ve ever encountered. At first, I was concerned it would be an awkward mix: tales of the Seelie and Unseelie Court just didn’t seem to gel with Australian eucalypts and contemporary Aussie teens. I’m much more accustomed to reading about the terrible beauty and cruel mind games of fairies from authors like Cassandra Clare and Holly Black, and I didn’t know if those old stories would translate so well in the antipodes. But Jodi told us in her FB chat that she was inspired by stories like Picnic at Hanging Rock, and after reading VALENTINE, I can see it. Plus I don’t think the location played as big a role in this book as in other books I’ve read (it was featured, but not prominently). The focus in VALENTINE was much more on Pearl’s inner monologue, her world and friends, the mystery of deadly fairy intrigue, and the interconnected relationships in the small town where she lives. Pearl’s voice was very close first person, very internal – and I think that worked well. It allowed me to be really caught up in Pearl’s emotional swings throughout the book. But Pearl isn’t just emotional – she’s smart. And that was one of the things I really enjoyed about VALENTINE, that our central protagonist was aware of times when she was being emotionally manipulated, and made a conscious effort to use her brains to think things through. Also – communication! Hooray! Pearl talks out misunderstandings with her older sister and brother, with her friends, and with Finn, the boy who isn’t really a boy but a fey creature (which makes his attractiveness easier to comprehend and understand). I liked that Finn and Pearl had to go through a process of research and discovery to figure out what kind of fey creature Finn actually is (although I thought he was a bit dense for not even trying to figure it out himself before now) – that may have more to do with my personal enjoyment of the ‘research team’ trope, but I thought it was a fun scene. Above all, Jodi McAlister knows her tropes and isn’t scared to use them. There’s not a lot of genuine genre fiction written in this country for YA audiences, and it pleased me greatly to see genre tropes used in clever ways in this book. 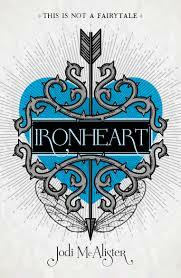 Will I be reading IRONHEART, the newly released sequel, to find out more about Pearl’s family history and what will happen to her and Finn? You can count on it. So what did you think? Leave a comment here, or on the FB thread, or leave a star rating for this book if you’re time poor. I’ve already got a new book lined up for May, and I will announce it in the next few days. Until then, thanks for joining in our group read of VALENTINE and have a good week! I was also concerned when I first started reading this – I had to review Ironheart for a magazine, so read both so I understood what was going on (good call). Fantasy is not the genre I usually go for in a novel, but I enjoyed this very much – mainly due to Pearl being feisty and smart and Finn being so dreamy and clueless for much for much of the story. I loved Pearl’s siblings and their general relationship too. I thought the Aussie setting worked well – the shed out in the bush that’s the party spot for the kids rang true for me. Like Ellie, I also enjoyed the “research team” aspect of the novel as well – the revelations were paced well and kept you interested in what was happening. Having read Ironheart, I can attest that things get even more interesting as the story goes along – and I will definitely be seeking out the third installment. Can Jodi give us a timeline for that one? The way she deals with consent- Forget all those useless PDHPE booklets, just make every teen read this. I crushed early and hard for Finn but this is not a story where her attraction overrules her sense of self. He violated her, she can’t trust that her feelings for him weren’t informed by his presence in her subconscious. Ugh, more of this! It’s so messy and it hurt because he didn’t understand what he did as a violation of her mind and body – But just because he didn’t know that doesn’t excuse it. I love that this was dealt with properly and it wasn’t a case of love + attraction means all can be forgiven. I love this book, I was immediately annoyed that I had to wait a year for Ironheart (And felt the same again when I ate up Ironheart in one sitting).